It was just starting to cool off at the end of October, and the fish in lodge hadn’t really fed properly yet with a few of the lakes bigger residents not come out for a good few months. There had been a large amount of pressure throughout the season as the lake was getting publicised for doing some nice carp, this meant anglers from all over the north west fled to the lake making it a nightmare for me and the other 10 or so regulars to get anything going, it was my first season (well, half season) on the lake after doing a bit of time on the other side of the complex fishing for mill lakes inhabitants, managing to have a few fish to just over 17lb. Anyway, now that the cold weather was starting to close in the fair weather anglers started to disappear, for me the perfect time to try and string a few captures together before the big freeze hit. By the Thursday a big low pressure headed in, and came with it the rains, winds and overcast conditions, perfect. By Friday morning I had everything ready to go for when I finished school I cold race the mile home from school and grab the gear. 3:45pm on the Friday saw me arrive at the lake, to see one of my pals Lloyd had bunked off school so he could drop in early, it was nice and overcast but weirdly warm, so I dropped the gear with Lloyd and went for a stroll round. There was only Lloyd on, so all I had to do was find them and fish the way I had wanted to for the previous months. The lake had a slight ripple on it but nothing major so I carried on round until eventually I was stood looking at the bay on the back of the wind when out of the corner of my eye I saw a fish stick its head out. So walking into the nearest swim I watched for a further 10 minutes, so with nothing else to go on, I lugged the gear round and began getting some traps set for the night. By 10 past 5 I had both rods in position, the left hand rod where the fish showed, on a single hookbait with a long hair, just off the point on the bottom of the shelf, 10 freebies and with the line slackened off it was done. Second down the edge on a gravel strip in 5ft of water, again 10 baits finished the trap. For the next few hours I sat there watching to no avail, Kalan arrived just on dark with his gear, I advised him to set up down the bank, as I thought there would be a good few fish in this section of the lake. The night was spent drinking tea and watching with Kalan, and at 5am I awoke to a short burst of bleeps on the left hander. Very violent, tip bouncing, line slack again. I sat there watching as you do and having recognised that id either spooked a fish off the spot or actually been picked up and done over. The day progressed and I spent most of it with line out of the water wandering round, the wind picked up blowing into the peg 7 bay, I have to say it looked spot on, so I was straight on the phone to my dad rearranging that id leave at 12 the next day. By now the lake was getting quite busy, so I rang Lloyd to ask him whether he was staying on and if so to get down on this new wind quick so that no one could jump next door and cut me up. Anyways by 2pm me and Lloyd had bivvies up in swims 20 yards apart in the end of the bay, Lloyd was fishing, but I had to nip home to grab some supplies to last me till the next day, (the lake is only a 10minute walk from my home). 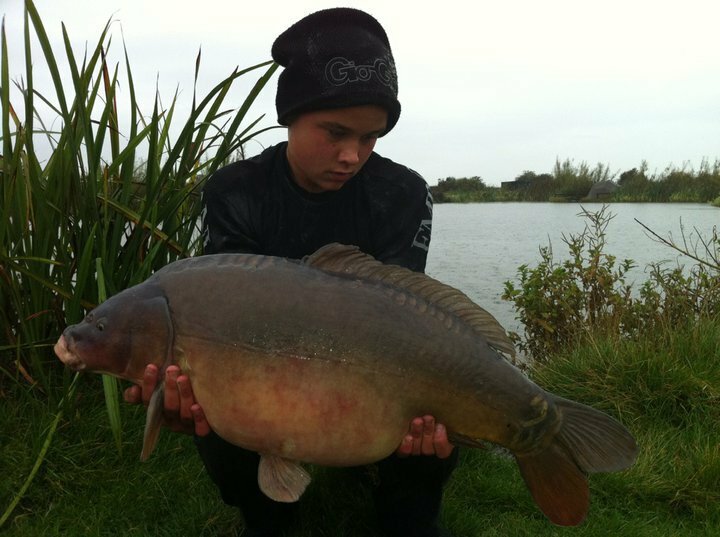 o by 3pm I was ready to get the rods out, I had no idea of the lakebed in this area, but another of the regulars, had been in the swim recently and taken 'bens mate' at 24lb from a small hole in the lake bed, he showed me the spot which was only of 1metre wide, and as I came to chuck a rig onto it, it went down bang on first time, the lakebed is firmer in this spot, probably due to feeding, so when I got a positive thump down I knew I was bang on as it was all thin silt and silkweed around it. The rig was 6inches of a soft coated braid that had been straightened out, to a tiny supple section, a wide gape hook fished blowback style with a long hair and my favoured hookbait tipped with a bit of plastic and PVA foam for presentation confidence. The other went of the bottom of the shelf in front of a swim was unattended throughout the whole summer, 10 baits around each and lines slacked right off. During the evening I sat reading carp magazines and drinking tea. By nightfall I was brimming with confidence, and just into dark I heard a heavy fish bosh out just up the bank near where the second rod was positioned. I dozed off somewhere around 1am. 6am I awoke and still half asleep put the kettle on for the first brew of the day. The swim looked a lot less inviting than the previous night, heavy showers and a lot cooler than the previous days, at 8am I wandered round to Lloyd's for a chat and a brew and he was packing up, he'd had a call that he had to go to work for a few hours to fill in for someone, so I wandered back and he disappeared off. At around 10am, I just got that feeling where you just need to re-do a rod so wound in, fresh rig on, same setup, and 5 more baits over the top. The rain slowed up at around 10.30am, and just turned to light drizzle, the lake looked dead, I hadn’t seen one show all morning, but stuck it out till I had to leave, around 11am, the rod on 'bens spot' let off a few bleeps, then melted into a steady take, I lifted into the fish and was forced to backwind from the off, it was a heavy, powerful carp, after it took around 15 yards of line I turned it just as it kited towards the island, I heaved and it came round, and after 10 or so minutes of it plodding round I eventually scooped a leathery, red coloured fish. I opened the bail arm, laid the rod next to the net with the fish in the edge, and went to grab my scales and sling. Fortunately, Josh Edwards, a regular angler on the lake was fishing up the other end so I gave him a ring and he gladly wound in and came round. I lifted the rim of the net and it appeared to me that I'd underestimated the size of the fish; it looked a good upper 20 and was a real wide fish. I lifted the fish out into the cradle and carried into the back of the swim, pulling back the mesh. The wide gape was neatly embedded an inch back in the entre of the bottom lip, perfect. We slipped her into the sling and hoisted her up; she went 27lb 5oz, RESULT! Josh then got some snaps of me in my un-carpy t-shirt, soaked to the skin, but as happy as Larry, cheers josh. I waded out up to my waist in my jogging bottoms to slip her back, went trundling back to the swim like a drowned rat grinning from ear to ear. The fish is a very rare visitor to the bank in fact one of the least caught carp in the lake, and after checking the photos recognised it as 'the red fish'. I packed up at midday a happy angler!